​Chelsea striker Olivier Giroud has cast doubt over his future at Stamford Bridge, saying he is prepared to drop 'down a level' if it means he will be playing regularly. Despite his formidable form in the Europa League, the 32-year-old has started just six Premier League matches so far this term, with none of those coming since the arrival of Gonzalo Higuain in January. And with his contract up in the summer, there have been rumours linking him with a move to Marseille among a host of other potential destinations. Speaking to French radio station RTL (via ​ESPN), the World Cup-winning target man has voiced his frustrations at his lack of action in the league, alluding to a 'hectic' summer on the horizon. "Of course it's frustrating. I have the impression there is clearly no competition for places in attack since January. "It's like that, I know that I will only play in the Europa League. I try to do what it takes to be as effective and as important as I can for the team. "The future may be hectic this summer. I'm not afraid to go down a level to have more playing time. It could be I end my career in France." 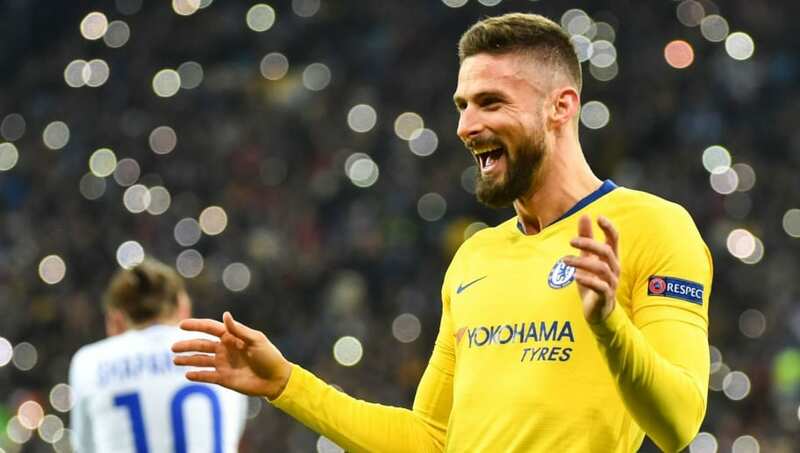 It remains to be seen whether ​Chelsea will spring to hold onto ​Giroud for another season, given they ​seem certain to be operating under a transfer ban for the next two windows. Having scored five goals in four Europa League matches since January, however - including a hat-trick as Maurizio Sarri's Blues ​overpowered Dinamo Kyiv to reach the quarter-finals last week - it doesn't appear there is a whole lot more he can do to earn his place.